So many conferences are a collection of unrelated sessions. 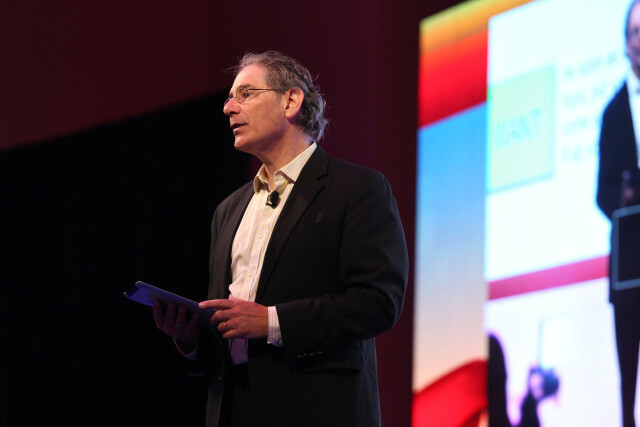 But the June 2015 PCMA Education Conference in Fort Lauderdale showed how a coherent set of meeting goals can be embedded in a congruent conference arc, improving learning and connection amongst attendees. Here’s what PCMA did. Although PCMA asked me to be the “conference facilitator” and “connect the dots” for EduCon, most of the credit for the conference design goes to the PCMA team. Pre-conference collaboration with the team was a pleasure. facilitate a closing public evaluation of the conference. Being up on stage so much, interviewing, and providing event continuity for as many as a thousand people was a new experience for me—definitely risky learning! Connecting the dots immediately after presentations is hard when you don’t know what presenters are going to say! When I accepted the offer of facilitating the conference, I only had a rough outline of the presentations, and I wondered about the content/learning arc of the event. To my pleasant surprise, as the event design unfolded, EduCon delivered a coherent set of sessions that shared common themes around predetermined goals. At the opening I told a story and shared the EduCon design goals: experiential learning, risky learning experiments, and meaningful engagement. 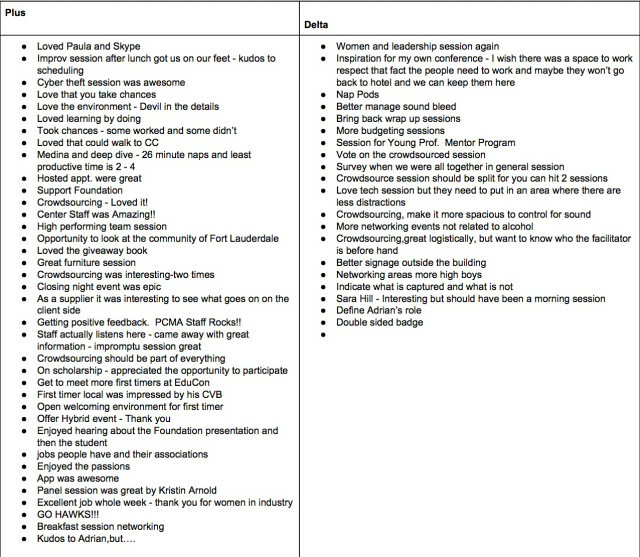 I’ll use [EL], [RL], and [ME] respectively to indicate how these three themes were woven throughout the event. John Medina’s opening session immediately touched on some of these themes. He described how prospect-refuge theory suggests that a mixture of private and public spaces provides an optimum environment for events, balancing the needs for safety [RL], frankness, growth and confidentiality with the openness required to spread content. John also spoke about the importance of high Theory Of Mind—the ability to reason about the mental states of others, what some might call empathy—for creating effective work teams that have high collective intelligence. (There’s a great test of your Theory of Mind ability Reading The Mind In The Eyes take it for free here!) It turns out that women have better theory of mind than men, which is perhaps why there are so many female meeting professionals—empathy is important in our industry [ME]. Interviewing John—who must surely be the easiest person in the world to interview—was a blast! I had 15 minutes with him on stage, followed by 75 minutes in a breakout. For the breakout I simply had the audience sit in curved theater seating facing John and me plus a couple of empty chairs, and had audience members with questions come up to the front of the room and talk with him. We could have easily spent another hour with John. Read my earlier post to learn more about the session crowdsourcing experiment I facilitated the following morning, which incorporated all three goals for the event [EL] [RL] [ME]. 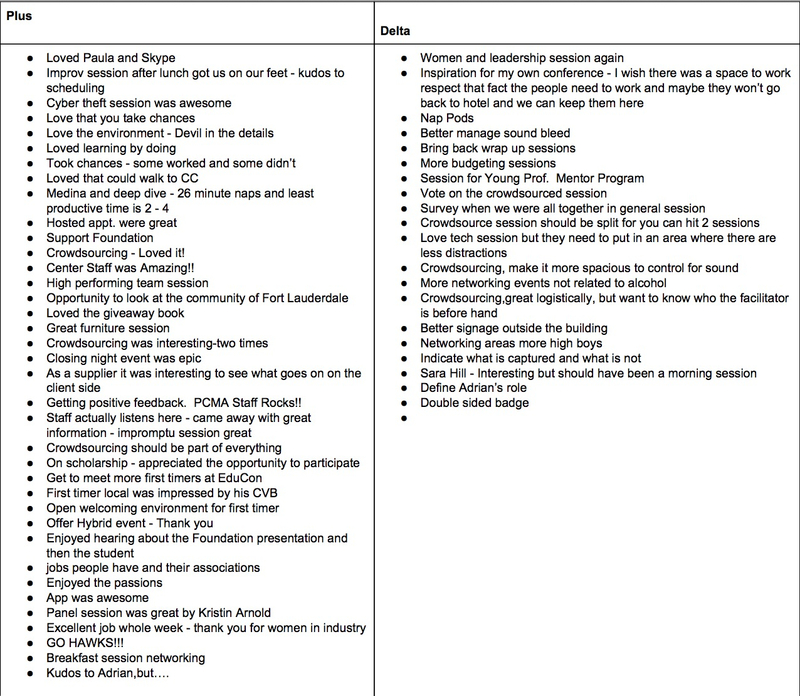 A few of the sessions chosen: women’s leadership in the event industry (described to me afterwards by several participants in glowing terms), cultural issues in international meetings (run by Eli Gorin, who seemed very pleased), and selling sponsorship (held in the round). After lunch I facilitated a personal introspective breakout session [EL] [RL] [ME], which provided participants the opportunity to think about what they had experienced so far, how their experiences might impact their life, and what changes they might want to make as a result. Afterwards, I received the same feedback independently from many people—they had gone into the session thinking they had little to say, and discovered during the process that there was a lot to talk about and get excited about. I have heard this kind of feedback for many years now, but it’s still gratifying to hear the conversation volume rise steadily and observe the palpable reluctance of people to leave their small groups when the session is over. I attended a few of the other breakout sessions during the conference, and observed a good mixture of [EL], [RL], and [ME] in all of them. Though I can’t be sure that those I missed followed the same path, the interactivity of the sessions I witnessed was unusually high for a meeting industry conference, and all the presenters I talked to had incorporated trying something new during their sessions. the “supple grit” needed to know when to keep working on an idea and when to stop before the work becomes dysfunctional persistence [EL]. The first question Sarah was asked at the conclusion of her talk was on overcoming fear [RL], which segued nicely into the subject matter of the closing session by Mel Robbins, author of Stop Saying You’re Fine. Mel delved deep (and interactively) [ME] [EL] into our fear of change and introduced her 5 second rule—if you have a game-changer impulse, act on it within five seconds or else it dies [RL]—another formulation of improv’s “say yes”. Mel closed with a powerful call to action, a key component of a compelling conference arc, to take ownership of our lives. After such a powerful session, I kept things short with my closing remarks, pointing out specifically how PCMA’s conference goals had been achieved, and then asking the audience to stand and applaud themselves, as the people who, collectively, through their own interactions, risk taking, and engagement had made the achievement of those goals possible. Awesome photo of me at 2015 PCMA EduCon taken by and licensed from Jacob Slaton! This entry was posted on Monday, July 20th, 2015 at 7:11 am	and is filed under Conference Spotlight, Event design. You can follow any responses to this entry through the RSS 2.0 feed.You can leave a response, or trackback from your own site.